Carla was first drawn to pilates in 1998 while recovering from injuries that did not improve after years of traditional physical therapy approaches. She found a Pilates studio that offered a rehabilitative approach to Pilates and her life was changed. She spent the following years in a long, involved training to learn how to teach movement retraining to others. In 2002, she became a certified Pilates instructor through The Physical Mind Institute and has also studied the STOTT PILATES method extensively. She studied and worked at The Albemarle Center for Health & Rehabilitation and found that years of working with an injured population taught her the art of seeing structural imbalances clearly. Holding a BA in Philosophy and Religion, Carla returned to school to study the sciences in 2005 and continues to study movement analysis and physical therapy techniques. She opened Posture Studio to keep others from developing chronic pain in their own lives. Carla currently works with a range of people, varying from post-rehabilitative clients to athletes. She also enjoys mentoring other instructors by teaching them the art of seeing and correcting postural alignment. She has a clear way of instructing that leaves clients feeling more knowledgeable about ways to approach movement in daily life and in exercise. Liz first discovered Pilates as a way to deepen her awareness of mind/body techniques and anatomical knowledge, and continues to study movement analysis and postural retraining techniques. In 2005 while dancing for a company in New York City, Liz received her comprehensive Pilates certification at Sal Anthony's Movement Salon, a program which encouraged developmental dexterity. While earning her masters in dance at Temple, Liz also began practicing yoga and fell in love with the physical, mental and spiritual journey that each practice offered. Liz holds a MFA in dance from Temple University in Philadelphia and has studied movement in various forms for most of her life. Liz has been a dancer in companies in New York and Philadelphia and an adjunct professor for dance at Piedmont Virginia Community College. Liz offers a unique perspective on movement. She has the aesthetic eye of a dancer, the postural and anatomical knowledge of a Pilates teacher, and the calm and clear presence of a yoga practitioner. She also enjoys teaching other forms of movement including both yoga and Pilates. Faith has spent most of her life studying movement. She began studying dance at the age of 5. By 17, Faith had discovered that running, strength training, hiking, and practicing yoga & Pilates fed her love of moving while also supporting her dance training. After receiving her degree in modern dance, Faith lived in Portland, Oregon, where she taught dance, mat Pilates, yoga, strength training, and worked as a personal trainer while also dancing professionally. Faith moved to Charlottesville in 2010 and has continued teaching in the Charlottesville area. Faith holds a BFA in Modern Dance from the University of Utah. She has been a dance faculty at Piedmont Virginia Community College and also at teaches at ACAC. Faith's teaching is easily described as lovely with the intellect to accompany her teaching gift. Faith approaches her classes with a comprehensive knowledge base and a calm awareness that is palpable. Heidi has been a group exercise instructor since 1997 and a personal athletic trainer since 2008. Heidi has a natural gift for working with people. Her knowledge base allows her to offer a strength training approach to teaching Pilates. Heidi has pursued a life of physical and emotional health and works to empower others on their healing journey. Her Master's Degree in Therapeutic Recreation and her Strategic Intervention Board Certified Coach training come through in her nurturing way of approaching her clients while also pushing them to go farther. With a knack for postural analysis and movement retraining, Heidi is great at assisting people through difficult movements with a sense of humor that keeps even her hardest classes lighthearted and fun. Heidi's classes are initially focused on form and function, and quickly shift to challenging the student to break through both physical and mental barriers. Bettina received her B.A. in Dance and Musical Theatre from Marymount Manhattan College in 2007, and has danced with both ballet and contemporary companies from New York to Los Angeles. Bettina was first introduced to Pilates as a teenager as a way to rehabilitate her body after an injury, and has continued classes ever since. In 2010, Bettina received her Doctorate of Physical Therapy from Virginia Commonwealth University, pursuing an emphasis in dance medicine during her graduate studies. As dance is a passion of hers, Bettina incorporates her movement background into her physical therapy treatment and has gone even further by blending Pilates training into her practice. Bettina received a comprehensive Pilates for Rehabilitation certification through Polestar Pilates, and has loved being able to integrate her studies to educate people on posture, alignment, pain management and injury prevention. Currently, Bettina works as an orthopedic physical therapist at ACAC, and in her free time enjoys spending time with her husband and 2 small boys. Sarah started her daily yoga practice about 5 years ago, but has been active most of her life. Since receiving her teaching certification in 2016, Sarah has discovered a passion for anatomy and movement science. A lifelong student, Sarah has studied with Ray Long and participated in distance learning with Amy Matthews and Leslie Kaminoff. Sarah received her BS in Psychology from George Mason University. She hopes to combine her love of neuroscience with her love of biomechanics by learning more about neurocognitive control in movement perception. She uses her personal experience and training to influence the content of her classes and help her students discover mindful movement. Sarah enjoys working with students of all ages and abilities. Monica began practicing yoga in 1996 in a successful effort to stop chronic back and rib pain that she had her entire life. Over the past two decades, yoga has taken her on many journeys, both spiritually and physically. Focused on healthy alignment, her classes bring awareness to the body in space and the relationship between engagement of the body and movement. Monica has been teaching full time since moving to Charlottesville in 2011 and continues her studies in anatomy, breath, and movement. Challenging her students both mentally and physically in her rope wall classes, she blends core activation, conditioning movement, strength building, alignment and relaxation. The techniques learned can be applied off of the rope wall and onto the mat for any other physical practice. When Monica isn't teaching and practicing; she's busy taking care of her family, trying to be cool enough to hang out with her teenager, and searching for the best dessert in Charlottesville. Courtney, (apprentice teacher ) began Pilates, albeit inconsistently, in 2013 as part of her already very active and physically demanding (but injury-free) lifestyle; however, it was not until a 2017 postural-related injury that she came to fully appreciate the life-changing benefits of the practice not only to heal what ails us but also to maintain a healthy body and prevent injury. Informed by her background in yoga and interest in mind-body awareness and body mechanics, Courtney knew that she had to deepen her understanding of and appreciation for Pilates by completing the Stott Pilates Intensive Reformer Instructor Program in 2018. Courtney received her BA in Philosophy from the University of Colorado at Boulder and her JD from Tulane Law School in New Orleans. Through her Pilates and yoga instruction, Courtney hopes to help clients to become more aware of their bodies, to feel more in control of their postural health, and to be more confident in the way they walk through this world. Elizabeth Beasley (apprentice teacher) is a Community Relations at UVA Health System who is passionate about helping others and has felt privileged to work in community health in Charlottesville since 2005. When Elizabeth is not working, she loves to sing, cook, hang with family, play tennis, garden, and she loves Pilates! A student at Posture Studio for many years, Elizabeth recently underwent her Stott Pilates training and is continuing to study at Posture Studio. We are honored to have Elizabeth join us at the studio. “My yoga teacher, whom I trust, talked about the benefits of Pilates and invited me to have a postural evaluation by Carla. Within ten minutes in that eval, I realized much of what I'd been taught about holding my shoulders and chest and hips as a male, was all wrong, and a likely contributor to my episodic back pain. So the reasonable next question, was now what? 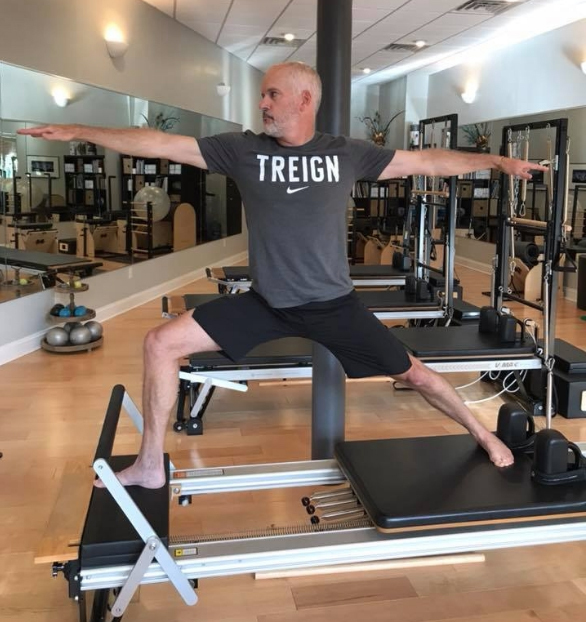 “I continue to take classes because 1) My back pain is gone, 2) My awareness of how may body works and what is proper alignment is growing, 3) the variety of classes and their creativity keeps things interesting, and 4) the instructors take time to understand your limitations and goals and give individualized feedback when necessary. I guess that's technical speak for "the instructors make you feel loved.